Another small project I have is this great model of Inquisitor Lok from Forge World. But what is that next to him you ask? That's the glue I'm using. It's women's fingernail glue. You know... the stuff women use to attach their fake nails with. I have a friend who scratchbuilds with plasticard and this is what he swears by. He'll use nothing else. Me personally, I think it's basically superglue. I will say that it comes with a great, tapered tip that allows you to apply the tiniest of drops in the perfect place. 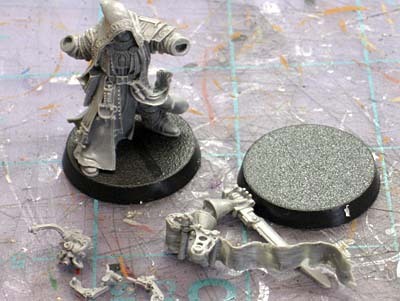 Given the size of the good Inquisitor there, I'll need to be as neat as possible when putting this guy together. The only drawback I have is that it can be a little difficult to get the glue out of the bottle. Maybe it's the tip, maybe it's because you can't really squeeze the bottle since it's so rigid. Either way, it's a small price to pay for being able to apply the perfect amount of glue without having to resort to using a pin to apply it. This guy has some absolutely stunning detail when you get your hands on him for real. 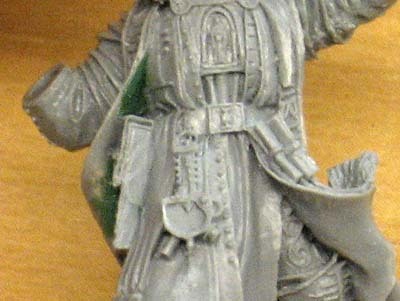 Unfortunately, it comes with a price (and not just money), I had a good amount of flash and mold lines that had to be removed and even a few areas that were so thin they didn't fill when cast and had to be filled with greenstuff. First time model builders should shy away from this guy, he's not a model you want to go experimenting with. That's why I do all of this with other people's models. I would never take these kinds of chances with my own stuff. 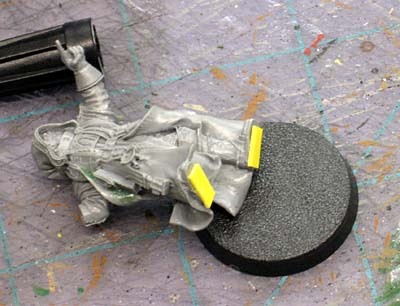 Same as I do for all my models, a small piece of plasticard under each foot raises him just enough so he doesn't look like he's sinking in quicksand when I base him. I'm going to paint him up similar to the Forge World version and I'll post the results when I get him done. I've always loved this model. Can't wait to see him finished. I look forward to watching this one come together. I've always wanted to paint this model and appreciate your review of it as well. Thanks for the tip on the glue. I need all the help I can get when applying glue - the bigger the blob, the better the job - just doesn't cut it when working with tiny little models. It is the stuff of deities. Cannot be beat for $2.36 a tube that lasts a long time. I am allergic to superglue so I am interested in the nail sticker. Of course if it has the same formulation as superglue then i am stuffed but maybe it doesn't. I don't do it on everything, mostly small models, but I've used the plasticard under the foot trick a few times now. thanks again! Unfortunately, my next post on this guy will not be as upbeat... I have some bad news concerning him. I hope it turns out OK in the end Ron it really is a nice mini. 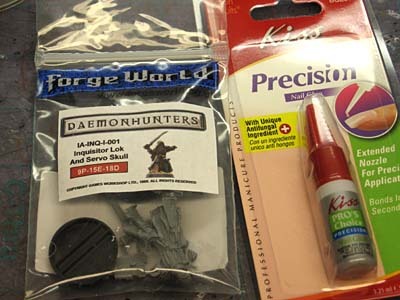 Thats indeed a great tip on glue for metal/resin models. The stuff i use for plastic models is similar (uhu plast needle)what i do with the needle is cut it diagonally which give you great control over the point where you want the glue applied. For myself I prefer using superglue that comes with a brush tip. I find I get far more control from it. I am forever getting big drops etc from the nozzle type tips. Pointing minis always look like they've just seen bigfoot or something. Are you doing a Retinue for him? Have you had any clogging in the tip? Thats my big poblem with most super glues. Charles, have you had the loctite tip clog at all? I almost bought it a while ago but was worried about the tip clogging. suspire: I haven't done anything special with it yet (other than wipe the tip off each time after use) and it still hasn't clogged up yet. It's been sitting on my desk now for about a week and has been used on a couple different models.